Social Media is amazing to me. 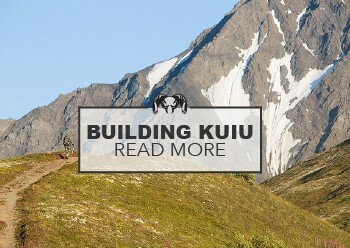 Pedro who lives in Spain reached out to me at the very beginning of Building KUIU willing to support and help this brand become something special. On his own, Pedro has built a loyal customer base in his country. 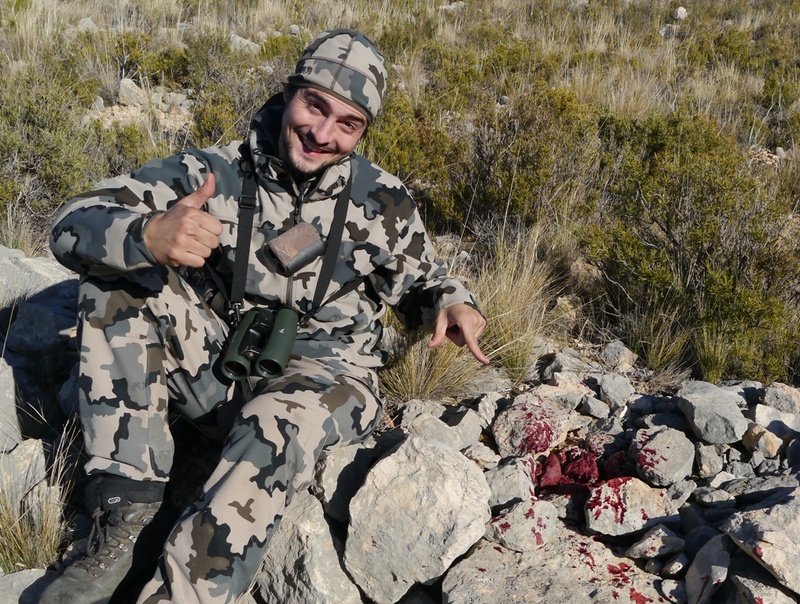 Pedro and our great Spanish customers and guides continue to spread the word of KUIU. I am so grateful. 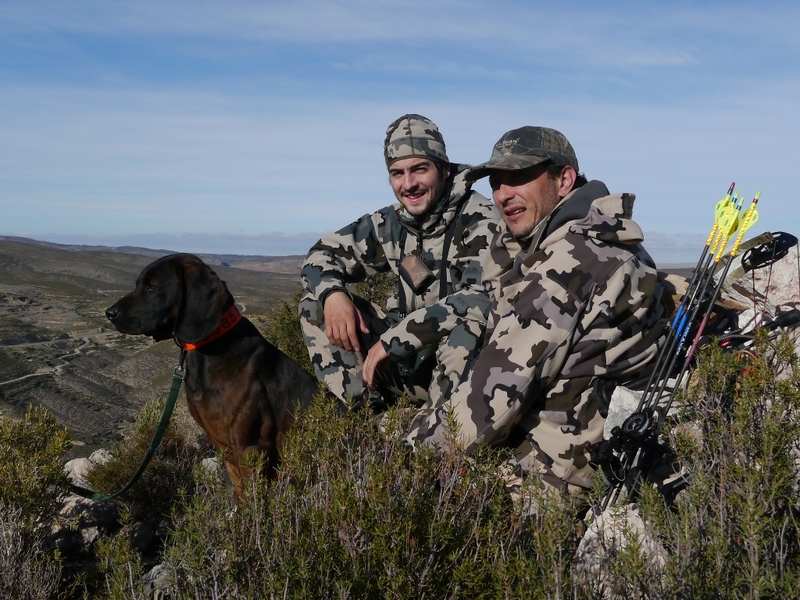 In this process Pedro and I have become very good friends and he shares his hunts with me, which are stunning. 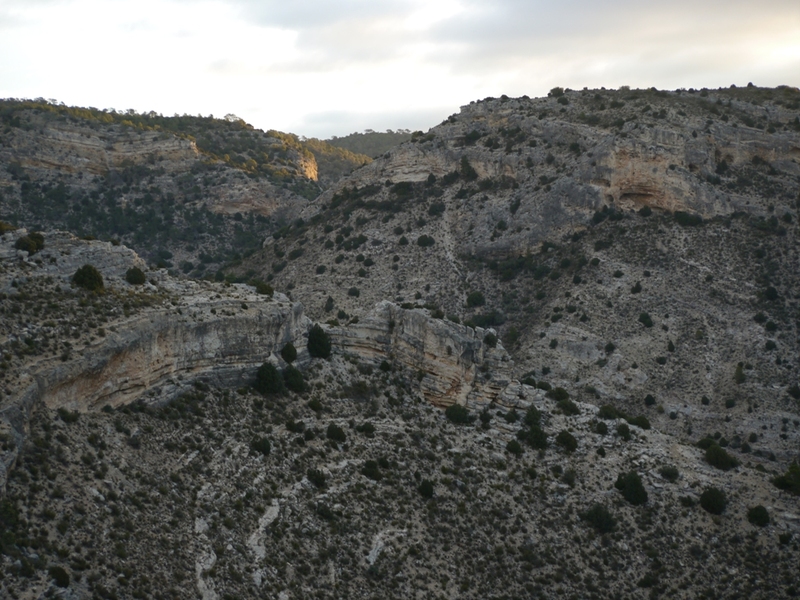 He sent these photos to me a couple of days ago of his Ibex hunt and I asked if I could share them with you. He added in supporting text. I know you will enjoy his photo essay. I wish him luck as he leaves today for Pakistan with his father to hunt sheep. Be safe my friend. 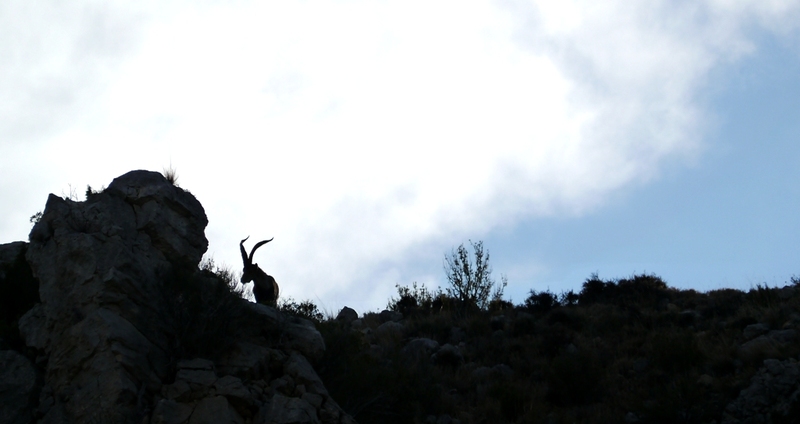 Every year I reserve some days to go hunting ibex. 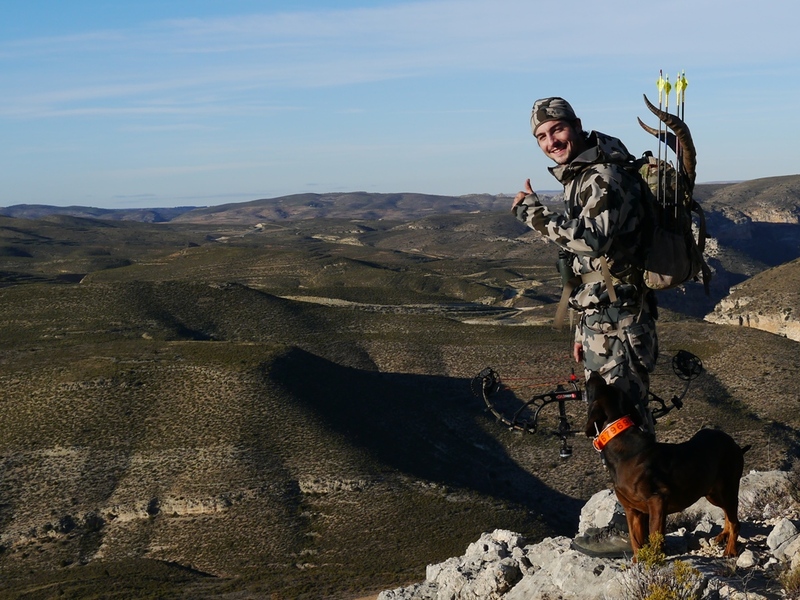 This time I have been hunting in the Spanish province of Teruel. 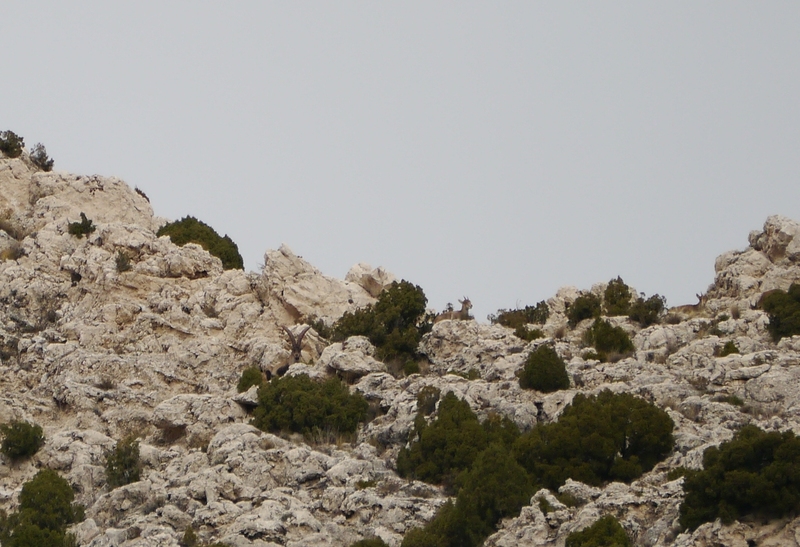 The area can’t be more open, which allows to spot ibex from really far away. 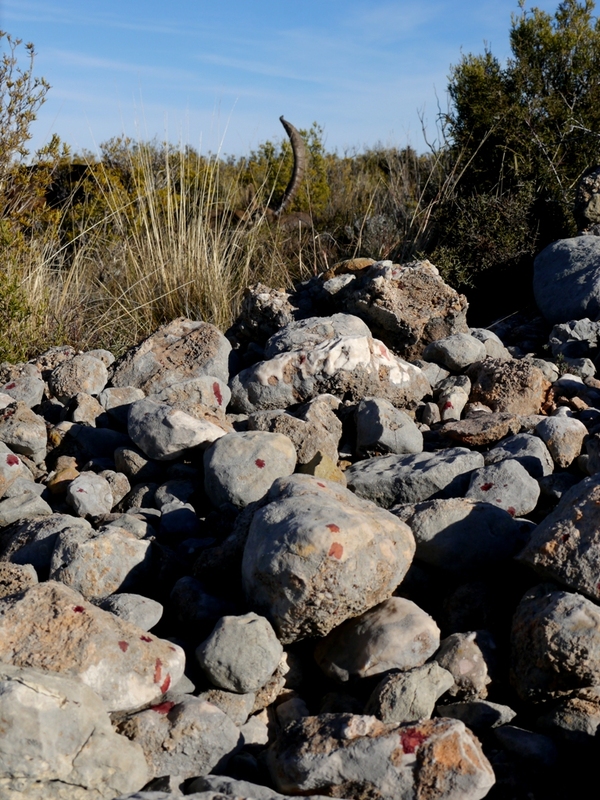 I love this kind of landscape for hunting with the bow. 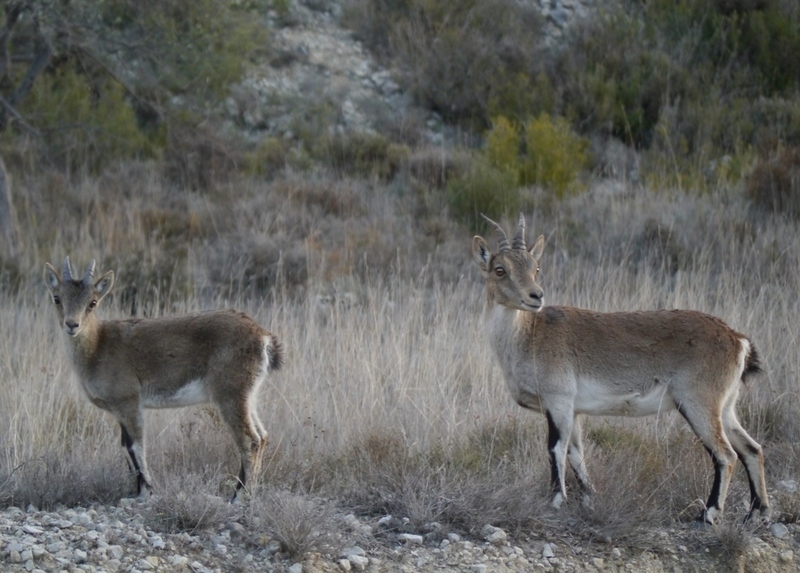 In Spain there are four types of ibex, and the target of this trip was the “Beceite Ibex” which is the largest one of them all. 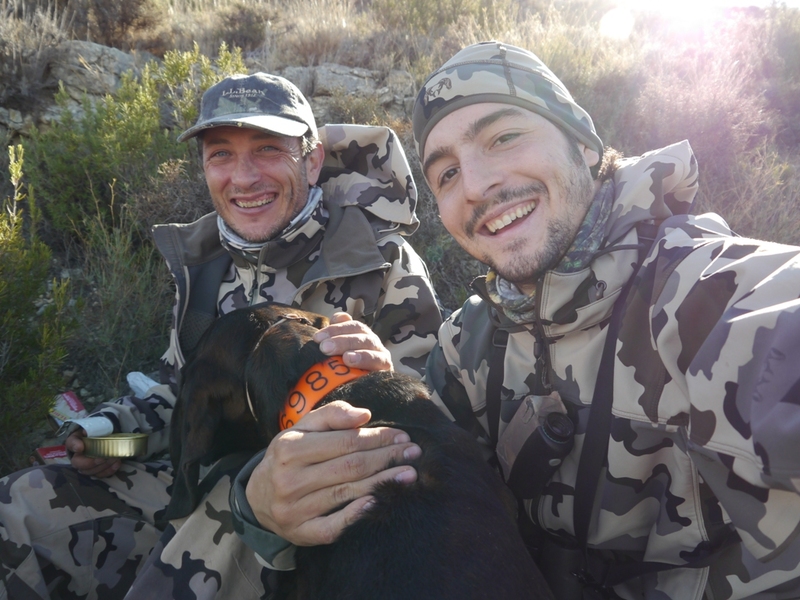 I went hunting with a good friend of mine, Daniel Herranz, who operates Greenatur SL. 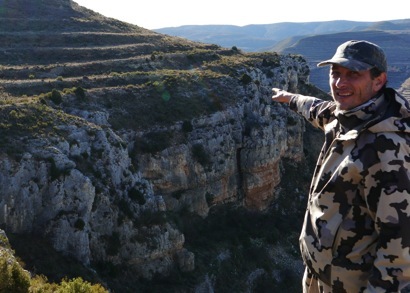 He is currently managing what are probably consider to be the best hunting areas for ibex in Spain. The most important thing for me is hunting with good friends. That is the only way you can assure a successful hunt, no matter if you end up getting anything. 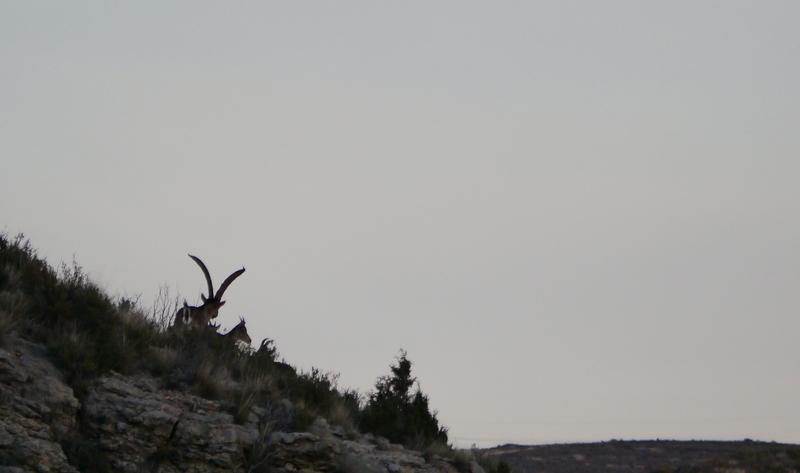 It was currently the end of December, and the rut had slown down a little, but we could see ibex of all sizes all over the place. 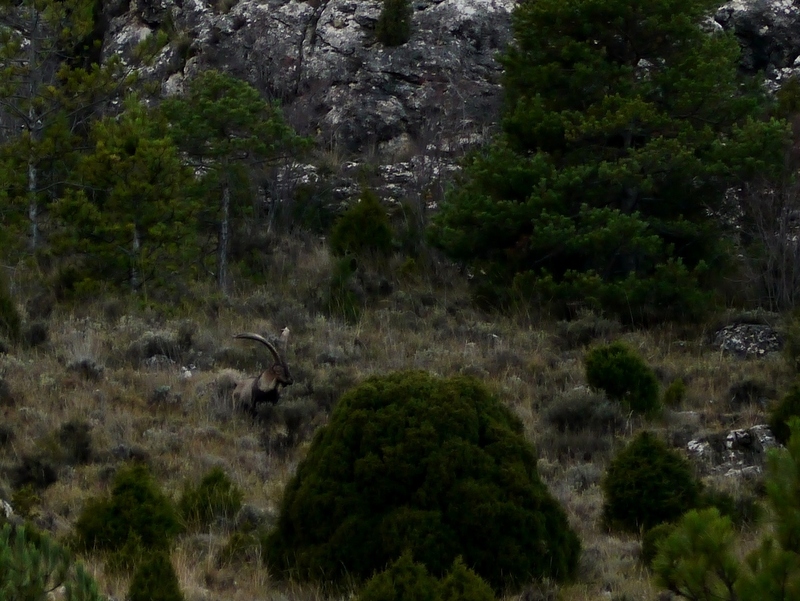 Finally almost a mile away, we spotted the ibex we were looking for. Ibex is in the top left corner. Pedro is hiding in the bottom right. 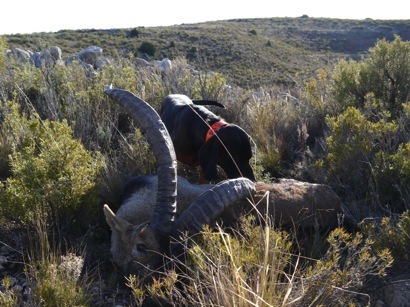 We made a gorgeous stalk and almost got a shot at 35 yards, but the ibex followed a nanny and disappeared in the blink of an eye. It took a bit to spot the same group again, and by that time, they were already on the top of the mountain. However, it was our last day and our last chance, so the stalk had to go on. 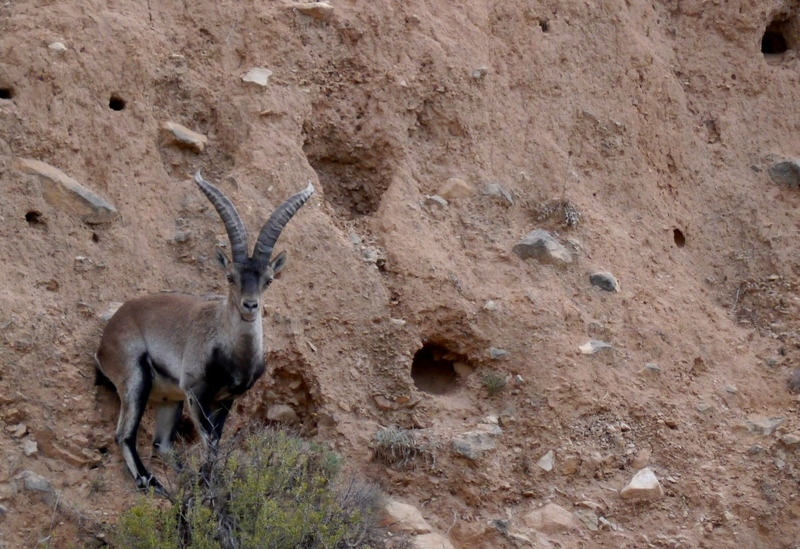 I climbed a 100 feet wall to get to the ibex level, and moving in all fours I got as close to the group as I could. All the group was by that time laying down, so I waited for their next move. Suddenly a nanny whistle at me, and all the group stood up. 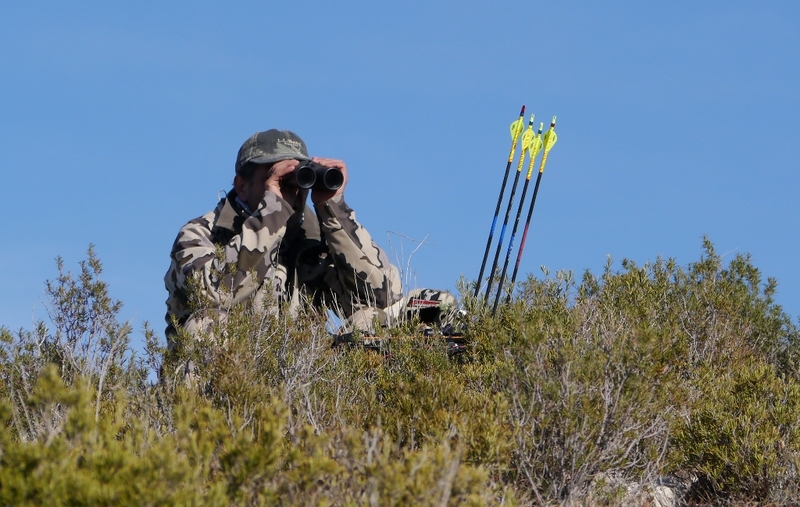 The ibex was quartering away at 65 yards. 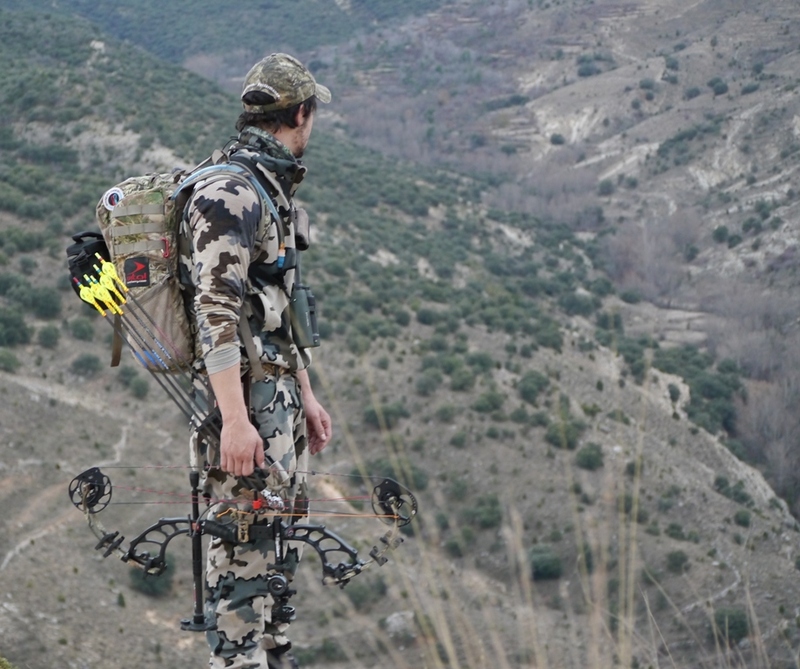 I drew the bow and put the 55 yard pin on him… The arrow flew straight toward the ibex, hitting him a little to the back. I kept a close eye on the ibex until I saw it fall down! I think we all hunt to experience moments like this one, when effort, patience and opportunity meet. It was an easy tracking job for my Bavarian Mountain Bloodhound, but he never minds! I felt really lucky… an amazing result for an amazing team work! Thank you for passing this onto us. For those of us stuck here in the western U.S., (with nearly all the hunting opportunities completed) this is an encouraging reminder of why we hunt. Wow what an amazing hunt thanks to both of you for sharing it with us! Great story and pictures. Thank you for sharing. Congratulations Pedro for the Ibex. Good luck in Pakistan and take care of yourself. Bring us a great story. 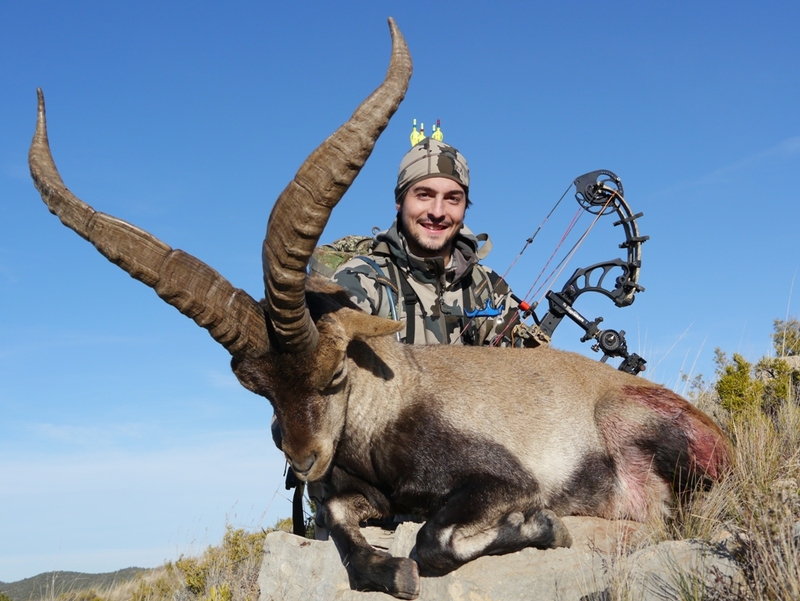 Great hunt, wonderful story and a super ibex. You two teamed up well. Daniel is still doing well. Best of luck with the sheep. Great job Pedro! Keep up the stories, they are great to see and read from other places in the world and great looking animals. Thanks to Jason too for putting his story on the blog. Great hunt! Love the bloodhound. Great hunt and an amazing animal! Amazing hunt! Congrats!. Loved the pictures! Enjoy your trip to Pakistan! Great hunt! Congrats! Those pics are Amazing! Have fun in Pakistan! Good job my friend, cant wait to have a go at one of those!!! That’s an awesome looking trophy and congrats! Thanks Pedro, nice pics and a great story. We spent two days hunting authentic, with a friend is easy. It’s always nice to hunt with you. Congrats Pedro! That is a great animal, he has a cool look to him. Thanks for sharing. Awesome job Pedro! See you when you come stateside! Congrats Pedro! What an awesome hunt. I need to get out to Spain one day. 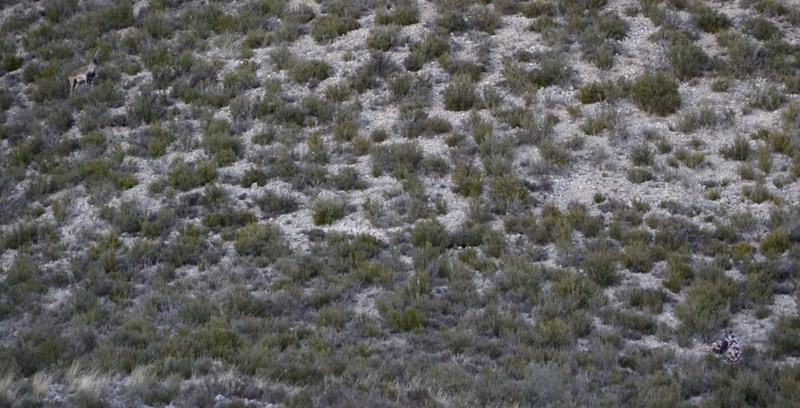 That is beautiful terrain, Pedro, with a spectacular game animal to chase. Your shot was great, although I would never have even had the opportunity for a shot since all I shoot are traditional bows — mainly longbows these days. 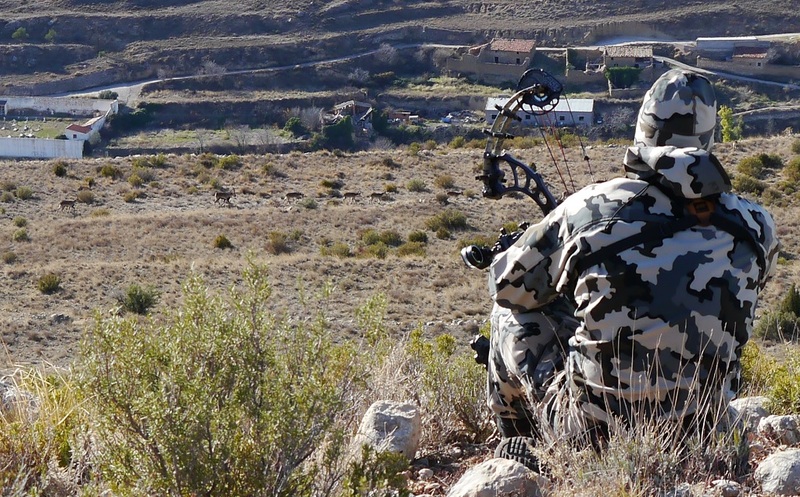 The Kuiu gear is, of course, ideal for the hunting you do, as it is for most of my hunting. I’m glad you can help promote this important venture that Jason has undertaken which benefits all of us hunters who have to use our own legs in difficult conditions to get our prey. Thanks for the pictures and the story of a neat hunt. Good luck in Pakistan on the sheep hunt. That looks like a lot of fun. Congrats on the hunt! Good luck in Pakistan! excellent publish, very informative. I ponder why the opposite experts of this sector don’t understand this. You should continue your writing. I’m sure, you’ve a huge readers’ base already!